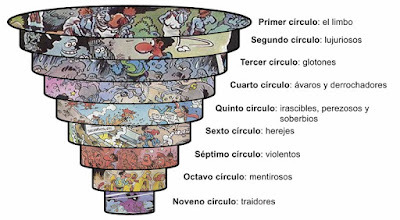 "... Hell's way, the lame walk as the wind ..."
Juan López Fernández, better known as Jan, is a Spanish cartoonist emblematic of the Spanish humor comic, who creates in chapter 28 of the series Super Lopez a good tribute to Dante Alighieri and his Comedy. A man named Sanatas has arrived at the office of the Chief - who is at that moment with Lopez talking about why he has behaved weird lately - to collect a debt, product of a pact ... With the devil! Pact that has resulted to the boss too much for the cost of payment, which is his soul. Jan makes his base of this story of three different slopes with a similar theme: Take the Faust of Goethe and shapes the first part of the story. 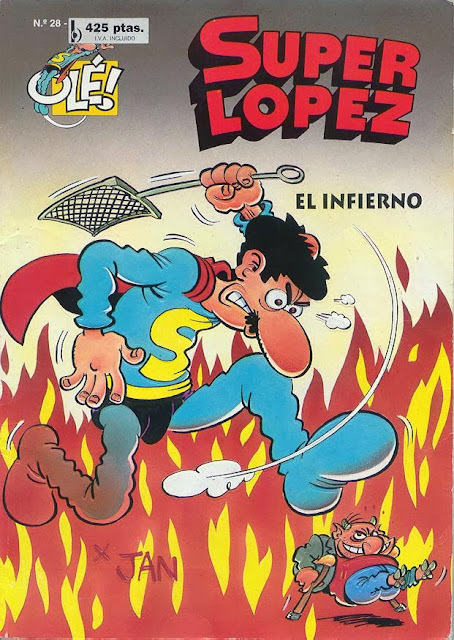 De Luis Vélez de Guevara takes the Devil Cojuelo and transforms him into a comic character, capable of putting in serious trouble to Super Lopez in his eagerness to take the contract of the Chief to Lucifer, feat that causes the absurd trip of this one for the nine Circles of Hell. But most of the story is based on the engravings of Gustave Doré and Dante Alighieri's Divine Comedy. I will not dwell on the details of each circle, this being a page dedicated among other things to the Comedy. 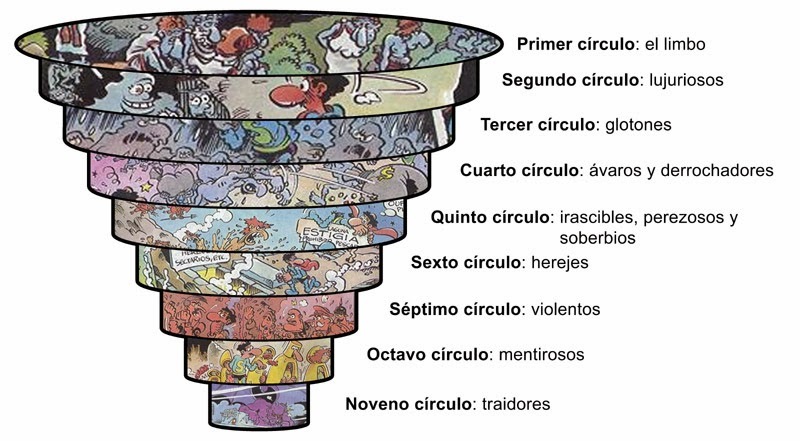 But he does emphasize that part of the narrative framework is based on a restructuring that Lucifer is trying in hell, now called Infierno Park. Wow, that is updating it. And it is in this commotion that Super Lopez pursues the Devil Cojuelo, which, in turn, we would say, serves as a kind of guide, running all the time but in turn taking the protagonist through each circle.